Strengthening exercises are performed once pain has subsided with active range of motion. The starting position (slight pronation) of an eccentric exercise for medial epicondylitis is shown. In order to prevent further injury, a trained therapist should instruct patients in exercises to confirm proper weight and technique. The eccentric exercise proceeds until full supination has been reached. ME involves primarily the flexor-pronator muscles (ie, pronator teres, flexor carpi radialis, palmaris longus) at their origin on the anterior medial epicondyle. Less often, ME also affects the flexor carpi ulnaris and flexor digitorum superficialis. Repetitive stress at the musculotendinous junction and its origin at the epicondyle leads to tendinitis in its most acute form and to tendinosis in its more chronic form. In addition, an ulnar neuropraxia caused by compression of the ulnar nerve in or around the medial epicondylar groove has been estimated to occur in up to 50% of ME cases. The tendinosis that occurs is primarily the result of failure of the damaged tendon to heal. Microscopic examination of the involved tissue shows granulation tissue, fibrovascular and fibrocartilaginous tissue, tendon microfragmentation, calcification, and necrosis. Histologically, damage to the involved tendons has been described as angiofibroblastic hyperplasia tendinosis and fibrillary degeneration of collagen. A simple, acute inflammatory reaction is noted to be a much less common finding than are the previously described tendinosis changes. No studies indicate a race predilection. A male-to-female ratio of 2:1 has been reported. Peak incidence is in patients aged 20-49 years, but ME is also seen in teens and older adults, especially if they engage in hobbies, jobs, or sports activities that make them prone to overuse injuries. Kiel J, Kaiser K. Golfers Elbow. 2018 Jan. [Medline]. [Full Text]. Barco R, Antuna SA. 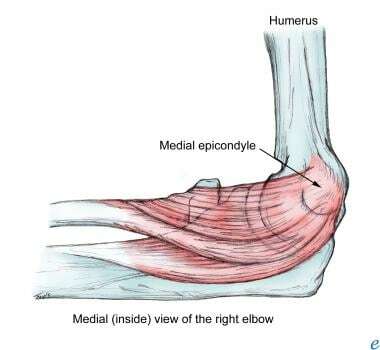 Medial elbow pain. EFORT Open Rev. 2017 Aug. 2 (8):362-71. [Medline]. [Full Text]. Rineer CA, Ruch DS. 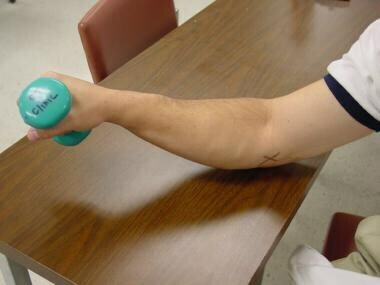 Elbow tendinopathy and tendon ruptures: epicondylitis, biceps and triceps ruptures. J Hand Surg Am. 2009 Mar. 34(3):566-76. [Medline]. Budoff JE, Hicks JM, Ayala G, et al. The reliability of the "scratch test". J Hand Surg Eur Vol. 2008 Apr. 33(2):166-9. [Medline]. van Rijn RM, Huisstede BM, Koes BW, et al. Associations between work-related factors and specific disorders at the elbow: a systematic literature review. Rheumatology (Oxford). 2009 May. 48(5):528-36. [Medline]. Farber AJ, Smith JS, Kvitne RS, et al. Electromyographic analysis of forearm muscles in professional and amateur golfers. Am J Sports Med. 2009 Feb. 37(2):396-401. [Medline]. Banks KP, Ly JQ, Beall DP, et al. Overuse injuries of the upper extremity in the competitive athlete: magnetic resonance imaging findings associated with repetitive trauma. Curr Probl Diagn Radiol. 2005 Jul-Aug. 34(4):127-42. [Medline]. Park GY, Lee SM, Lee MY. Diagnostic value of ultrasonography for clinical medial epicondylitis. Arch Phys Med Rehabil. 2008 Apr. 89(4):738-42. [Medline]. Krischek O, Hopf C, Nafe B, et al. Shock-wave therapy for tennis and golfer's elbow--1 year follow-up. Arch Orthop Trauma Surg. 1999. 119(1-2):62-6. [Medline]. Beyazal MS, Devrimsel G. Comparison of the effectiveness of local corticosteroid injection and extracorporeal shock wave therapy in patients with lateral epicondylitis. J Phys Ther Sci. 2015 Dec. 27 (12):3755-8. [Medline]. Gabel GT, Morrey BF. 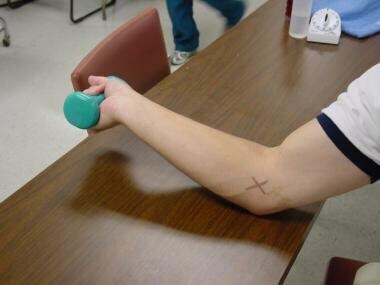 Operative treatment of medical epicondylitis. Influence of concomitant ulnar neuropathy at the elbow. J Bone Joint Surg Am. 1995 Jul. 77(7):1065-9. [Medline]. Shahid M, Wu F, Deshmukh SC. Operative treatment improves patient function in recalcitrant medial epicondylitis. Ann R Coll Surg Engl. 2013 Oct. 95(7):486-8. [Medline]. Kwon BC, Kwon YS, Bae KJ. The Fascial Elevation and Tendon Origin Resection Technique for the Treatment of Chronic Recalcitrant Medial Epicondylitis. Am J Sports Med. 2014 Apr 23. 42(7):1731-1737. [Medline]. Degen RM, Cancienne JM, Camp CL, Altchek DW, Dines JS, Werner BC. Patient-related risk factors for requiring surgical intervention following a failed injection for the treatment of medial and lateral epicondylitis. Phys Sportsmed. 2017 Nov. 45 (4):433-7. [Medline]. Stefanou A, Marshall N, Holdan W, Siddiqui A. A randomized study comparing corticosteroid injection to corticosteroid iontophoresis for lateral epicondylitis. J Hand Surg Am. 2012 Jan. 37(1):104-9. [Medline]. do Nascimento AT, Claudio GK. Arthroscopic surgical treatment of medial epicondylitis. J Shoulder Elbow Surg. 2017 Dec. 26 (12):2232-5. [Medline].